CSUSB is now one of 18 Beyond Traffic Innovation Centers across the U.S. whose main focus will be addressing and providing solutions for transportation issues facing Southern California. CSUSB is a commuter school, and many students deal with traffic jams on a daily basis, so this is an important issue that affects all of us directly. “I commute from Fontana and I always take the side streets to avoid the freeways because they are usually a mess,” said student Angel Valencia. The William and Barbara Leonard Transportation Center was created in 2006 with a emphasis on regional transportation needs, which is something we have been given the opportunity to build on by becoming an Innovation Center. The Leonard Transportation Center held a community conversation with U.S. Secretary Anthony Foxx as the guest speaker last quarter to discuss the future of transportation. Secretary Foxx discussed the 70 million more people that will be commuting on the roads over the next 30 years, and stressed how it is important that we have research centers analyzing how to prepare for this increase, according to The Sun. “It puts us on the map to come up with traffic solutions, basically being the door to be another voice and research center and an opportunity represent Southern California,” said Rudy Morales, graduate research assistant with the Leonard Transportation Center. Not only will we be an innovation research center, CSUSB will also be hosting conferences inviting experts to come together and examine traffic dilemmas and brainstorm solutions. One idea that is being discussed is the idea of a mega-region or megacommunity. A megacommunity is a circle where stakeholders voluntarily unite together around a major issue of national importance and pursue a set of practices and protocols that make it simpler to achieve desired results, according to A Transportation Megacommunity from the Inland Empire. Establishing a megacommunity means helping the Inland Empire population become diversified and better equipped with skills to solve transportation issues. “I came from Boston which also has a lot of freeway congestion, but here people drive a lot faster and every wreck is so bad,” said student Sam Shaw. “I am always seeing accidents on the freeway and its just creates even more crazy intense driving situations, there is definitely room for improvement,” continued Shaw. The Inland Empire currently has over 100 distribution centers and about 34,000 trucks fill our highways daily, according to A Transportation Megacommunity from the Inland Empire, so it is no surprise that we spend so much time stuck in traffic. 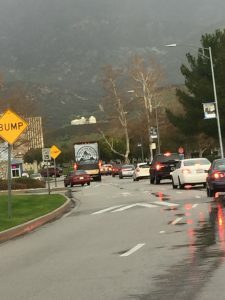 “For the campus, when it comes to traffic, University Parkway has three lanes and it is always so bogged down and that is the only main entrance to the campus and this creates a big headache, you always have to plan ahead for traffic,” said staff member Danny Sanchez. The program is still in the developmental phase and figuring out who all will be involved in the progress of transportation strategies, but the Leonard Transportation Center is working with the Department of Transportation as well as many others, according to The Sun. Lets Make San Bernardino Better!